Boho Tribal Baby Shower Decorations will welcome little baby or wish Happy Birthday with these adorable baby shower confetti . ♡ CONFETTI ♡ This package of table confetti decorations includes 100 Pieces and measuring between 3"-1". Glitter Pieces: 3 teepee, 3 dream catcher, 16 arrow and feathers, 12 tiny arrow and feathers. 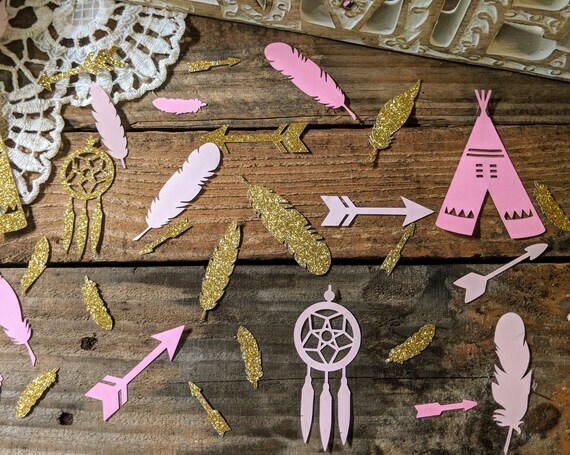 Light Pink: 3 teepee, 3 dream catcher, 16 arrow and feathers, 12 tiny arrow and feathers. Darker Pink: 3 teepee, 3 dream catcher, 16 arrow and feathers, 12 tiny arrow and feathers. Perfect for sprinkling around table centerpieces, gift tables, cake table, dessert buffets and guest tables and so much more at your baby shower, baby sprinkle and birthday parties.